Preparations for evacuating a new batch of terrorists and their families to north Syria continued within the framework of the agreement reached earlier to cleanse the countryside of Homs and Hama from terrorism. 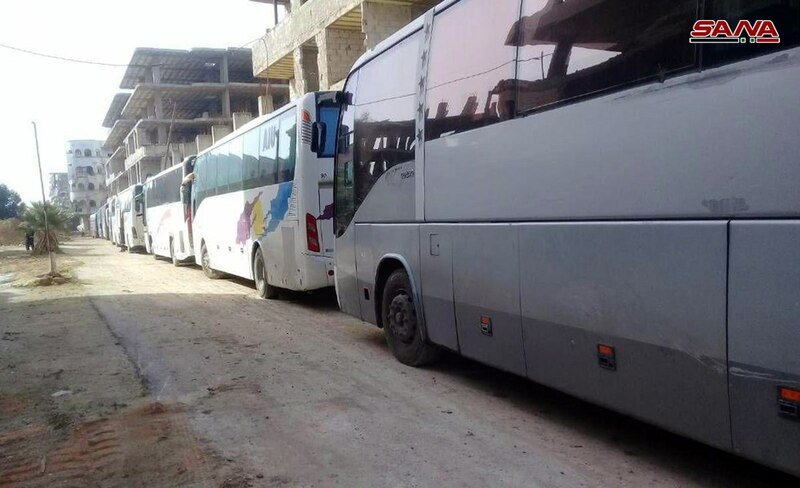 Military correspondent said that several buses entered al-Holeh and Talbessa areas in the northern countryside of Homs on Tuesday to transport terrorists unwilling to settle their status along with their families to the gathering point on the outskirts of al- Mukhtariyah village before heading to north Syria. The correspondent added that the buses are subjected to thorough inspection to prevent terrorists from smuggling any civilian or military abductees, mines or explosive devices. He noted that units of the internal security forces entered the villages of Ezz-Eddin, Salim, al-Hamrat, al-Qneitrat, al-Hamis and Hemimeh in northern countryside of Homs after being completely evacuated from terrorists. In Hama Countryside, the Syrian army’s engineering units started to dismantle mines and remove barricades in several villages and towns in the southeastern countryside of Hama in preparation for the entry of internal security forces to these areas. Military correspondent said that the last batch of terrorists and their families is expected to exit the countryside of Homs and Hama later today after which they will be declared free from terrorism. The correspondent said that technical and service workshops are continuing their work in rehabilitating Homs-Hama highway near Talbissa town in order to be put back into service.